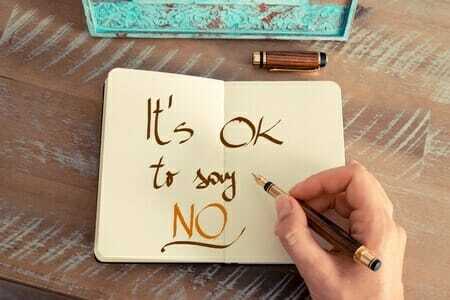 It’s Okay To Say “NO” To Others! When you can forgive yourself for past mistakes, and begin to fully accept your authentic self (who you really are under all those false personas you have accepted as your true self), then it becomes easier to achieve anything in life. To do this, you must not only make the choice to be happy but also be willing to change your life’s circumstance. And, one way to change your circumstance is to change your perception of what you BELIEVE your circumstance to actually be. To demonstrate this, let’s take a seemingly negative word and make it one of the most positive words you can use. I’m talking about the word “no”. How many times have you said “yes” to people or a situation when you really wanted to say “no”? I’m guessing a lot! We all do this much too often and usually for all the wrong reasons. They forced me into it. If I say yes to this, then maybe they will do me a favor later. I don’t want people to think I’m not any fun. If I don’t do it, then who will? If I don’t do this now, then I may never have another chance. I’m sure most of these examples sound familiar to you because it is simply human nature to want to please others at all cost – even if the cost is your own health. Now think about it. What is the worst thing that could happen if maybe, just maybe, you dare to say “no”, when you actually mean “no”? Well for many, before they even give themselves the chance to find out what would happen if they responded with a “no,” the self-inflicted emotion of guilt comes into play. UGH! Guilt over putting oneself before another person or situation. After all, isn’t that being selfish? And of course, from the time we were young we have been taught that being selfish is always wrong, and thus, choosing ourselves over another is indeed a selfish act. As someone dear to my heart always says, “guilt is only something you should feel when you have done something wrong.” So if you are to choose yourself by declining a request or invitation are you doing something wrong? Is it possible that by doing so you are giving yourself a chance to recharge so that you can be the best you possible? And really when you think about it, when someone tells you that you are selfish for caring for your state of well-being in any given moment, aren’t they being selfish because what they really want is for you to do what they want? When you don’t consider yourself when making “yes” or “no” decisions in any given situation, you are doing a great disservice to your authentic self, and that can ultimately have a negative effect on your health and state of well-being. 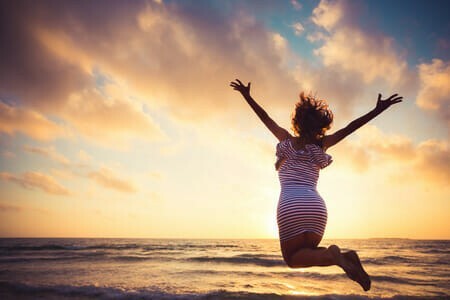 Ever since I recovered my health, I have been a big advocate for holistic health, but not just nutritionally and physically, but most importantly – emotionally. When I was sick, there was very little that I could do for the people I loved, let alone strangers. I was utterly depleted on all levels. I realized that I needed to take full responsibility for my life which, of course, included my health and my state of well-being. To do so, I needed to rediscover my authentic self. And by doing this, I began to follow a new path – one that was life-giving to my life experience. Because up until then, it was more than obvious that my life path was one if depletion – nutritionally, physically, and emotionally. Once I learned that is was okay to say “no” to others and “yes” to my heart, and the emotionally feeling attached to it is when things really began to become interesting in the best possible way! So are you ready to surrender to your authentic self? If so, then here is a little activity that you can start right now! For at least 30 days, keep track of how many times a day that you say “yes” when deep down you really want to say “no”. And each time this occurs, along with making a note of it, also write down why you said “yes” along with the emotions you were feeling at the time. In fact, I highly encourage to download a voice recorder to your phone and record your reason for not allowing yourself to say no. The benefit of this is, when you listen to the recording later, you will be able to hear the emotion attached to it as it was happening. It can be very enlightening. Was your choice to say “no” in line with your authentic self? To get even deeper, also ask yourself if your reason for saying “yes” was based on your assumptions and/or your perception of the situation? Sometimes we put so much weight on saying “yes” when saying “no” would have been perfectly fine! Lastly, there are also times when we say “no” when we really want to say “yes”! And in these cases, we may find that we are missing out on some amazing life experience. So the bottom line, always be true to your authentic self because as you learn to do this, I guarantee your life will change in an amazing way!